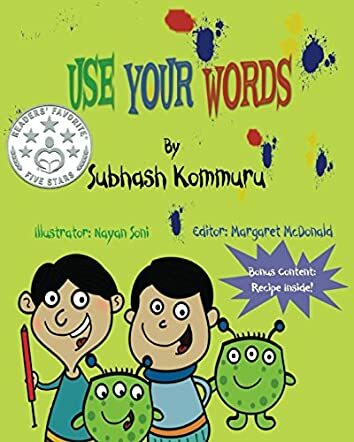 Use Your Words is a children’s book written by Subhash Kommuru and illustrated by Nayan Soni. Two young brothers, Ramesh and Suresh, are able to speak three languages, but prefer to talk a nonsensical type of gibberish at home. After being sent to their room for refusing to engage in proper small talk with their mother, the boys become disruptive, jumping on their bed until a portal opens up, pulling them into a different realm. The creatures that Ramesh and Suresh encounter know only one word, and use it every single time the brothers ask them a question. The boys become annoyed, but soon discover that the creatures only know that one word. Ramesh and Suresh decide to educate the creatures in the art of conversation, teaching them several easy sentences in English so they might be understood by others. The brothers also learn about why it is so important to properly communicate. Well written and beautifully illustrated, Use Your Words teaches children about the importance of proper communication. When parents are making small talk, asking about a child’s day and what they learned in school, regardless of which language is used at home, they are literally interested in being involved in their children’s lives. To have the child talk nonsense in return, in a language that they know their parents will not understand, becomes a tiresome bore rather quickly, but until the roles are reversed, the children cannot understand what all of the fuss is about. I like the cultural flavor which has been added to Use Your Words as well. Subhash Kommuru has given a general glossary at the beginning and a wonderful recipe at the end of the book, enabling the reader to gain some cooking experience and linguistic knowledge in Hindi culture. I enjoyed the important message which Use Your Words brings to the younger generation and recommend it to readers aged 4-8 years, so they might learn how to properly partake in the art of conversation.